The Michael E. DeBakey, Selma DeBakey, and Lois DeBakey Endowed Scholarship Fund in Medical Humanities was established in 2009 by the DeBakey Medical Foundation of Houston, Texas in memory of Dr. Michael E. DeBakey and in honor of Professors Selma and Lois DeBakey. Dr. Michael DeBakey received his B.S., M.S., and M.D. degrees from Tulane University in New Orleans, Louisiana where he was elected to Alpha Omega Alpha honorary medical society. He helped develop the mobile army surgical hospital (MASH) units and later helped establish the Veteran's Administration Medical Center System. He was also Olga Keith Weiss and Distinguished Service Professor in the Michael E. DeBakey Department of Surgery as well as director of the DeBakey Heart Center at Baylor College of Medicine and Methodist Hospital for research and public education. A pioneer in the development of an artificial heart and cardiac assistors, he performed the first successful human implantation of a partial artificial heart that he devised; a left ventricular assist device. Dr. DeBakey was a member of the most distinguished medical societies, having served as president for many of them. In 2000, the Library of congress awarded him its Living Legend Award and in 2001, NASA awarded him its Invent of the Year Award for the DeBakey Ventricular Assist Device. Dr. DeBakey was 99 years of age when he died on July 11, 2008. Selma DeBakey received her B.A. degree at Newcomb College and pursued postgraduate studies at Tulane University. Lois DeBakey received her B.A. degree in mathematics from Newcomb College where she was elected to the honorary scholastic society, Phi Beta Kappa. Lois and Selma, professors of scientific communication at Baylor College of Medicine in Houston, have credited their brother Michael with directing them into truly exciting and fulfilling, unique careers. This endowed scholarship assists deserving junior or senior student who are majoring in medical humanities. We are deeply grateful to the DeBakey family for their generous support of the Medical Humanities Program at Baylor University. 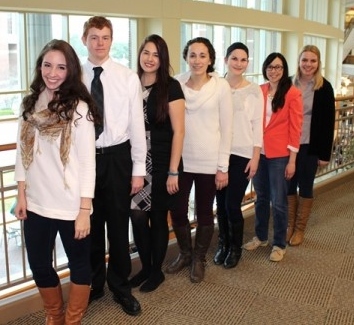 WACO, Texas (May 1, 2015) – Seven Baylor Medical Humanities students have been awarded the 2015 Michael E. DeBakey, Selma DeBakey and Lois DeBakey Endowed Scholarship Fund. Recipients are chosen based on academic excellence (maintaining at least a 3.7 science and overall GPA) and service in the health care field. This semester’s seven recipients include Savanna Garrett, Shannon O’Day, Sarah Brister, Hannah Bram, Lizette Lugo, Paul Koester and Hillary Villarreal. Established in 2009, the scholarship is awarded to junior and senior medical humanities students. DeBakey Scholars receive $10,000 of scholarship assistance on their way to professional careers in medicine and other areas of health care. "[Baylor’s Medical Humanities Program] strives to equip students with humanistic skills to complement their training in the natural sciences," said Jim Marcum, Ph.D., professor of philosophy and director of the Medical Humanities Program. Dr. Michael DeBakey joined the Baylor University family in 1948, when he joined the Baylor College of Medicine faculty (more than 20 years before the college became an independent institution). His accomplishments are too numerous to detail here — that would be its own blog post — but Dr. DeBakey’s New York Times obituary from 2008 gives a great rundown. Even after his passing, the long connection between the names “DeBakey” and “Baylor” continues today — certainly in Houston at the College of Medicine, but also in Waco, thanks to the Michael E. DeBakey, Selma DeBakey and Lois DeBakey Endowed Scholarship in Medical Humanities. Established in 2009 by a $500,000 gift from the DeBakey Medical Foundation and doubled in size by an equal gift from the foundation just this month, the DeBakey Endowed Scholarship provides assistance to junior and senior medical humanities majors at Baylor. The Medical Humanities Program takes a unique approach to educating the doctors of tomorrow by incorporating the insights of disciplines ranging from literature to economics to religion into the practice of modern scientific medicine. The idea behind the program (which is now being emulated at other universities) is to produce Baylor graduates with not only the scientific background necessary for a career in medicine, but also a sense of human understanding that will allow physicians to care for their patients as people. Sic ’em, DeBakey family and Baylor medical humanities students!